I had a lot of changes happening to me this past year, specially with my career, which basically is gone, and had to reinvent myself, but thankfully with Michael’s support I am making that transformation. I just love this guy, and I am so lucky to have him in my life, and yes, he is lucky to have me as well. Anyway, I have not been scrapping much, but these past few months I have been enticed by my wonderful friend, Ching to get back and attended a few Saturday crops as I used to in the past. I am not a speedy scrapper, so I have only made a few layouts since I have been back to the scrapping world, but hope to complete a lot more pages soon. While attending these Saturday crops I got to make new friends, which is one of the most wonderful benefits of scrapping that I enjoy so much. I met Karen, who Ching has been idolizing for a while and for a reason, as she is one talented scrapper. I also met Kari, who just started her own scrapbook forum and is about to launch a very exciting new kit club, and who doesn’t love one of those? Here site name is Urban Anthology, isn’t that a cool name? I have been known to be a major lurker or forums and blogs, but this one I love, as all my friends chat on it and get to meet new ones every day, as it is growing very fast. I bet the news is out, as we are just having so much fun! Right now with CHA 2008 Summer show coming out, we are all chatting about and seeing and going bananas over all the new stuff coming out and dreaming of all the pretty layouts we are going to make with all those pretty things. Gotta love new stuff!!! I already have so many on my wish list!!! But I have to be good….. Anyway, so I have made a few layouts, and I will post them here. First of my son and my cat. I love this layout, as I really love these SEI papers. 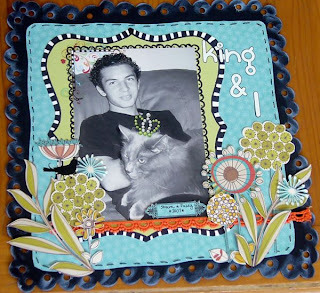 I love cutting things out, and even though they are both boys, these flowers weren’t too girly girl and neither of them opposed to having flowers around them. Well, in all fairness, Fuzzy (my kitty) didn’t really get a chance to voice his opinion…hehehe….so here it is. 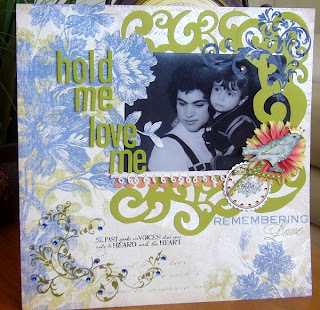 Than I worked on Michael’s two years old picture with his Aunt, which I so love. He has the most beautiful big eyes and just looks adorable. I used the K&CO line with some of those pretty KI lace papers, and while I am not totally in love with the way it came out (except for the bird, which was an inspiration from Karen, thank you very much), but it looks ok. So here is that layout. And finally my own two years old picture, which has a lot of different papers that would be too long to list and I really love the way this turned out at the end. 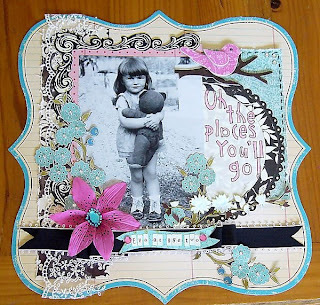 Ching added her input on this layout, as we always love to collaborate on layouts we work on and, she gave me the pretty bling to put in the middle of the flower. And here is my finished layout. I hope to create those cards soon, so I can post them next time. Well, that is all I have to say for now. Till next time…..